Recently installed Ubuntu 18.04 after the automatic upgrade from 17.10 failed, resulting in my inability to turn on the system normally. After installing the OS the brightness controls on my laptop has stopped working. 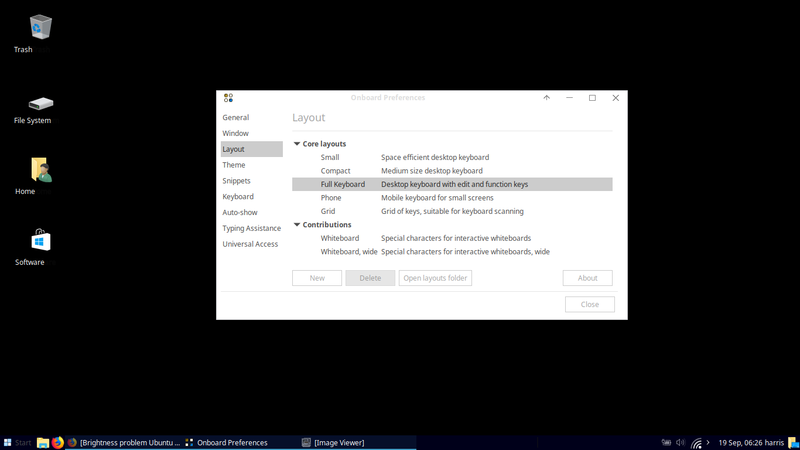 There are no brightness controls in the settings either in the new OS either. How can I get it to work? I just found out an option in the Power Management section, "Handle display brightness keys", which by default came deactivated. I just turned it on and the Fn+F11/F12 keys work as expected. Perhaps there is a similar option in the Power Management section for Ubuntu vanilla and other flavors. On Xubuntu 18.04 (Ubuntu with xfce desktop) my brightness problem finally solved. I opened 'Onboard Settings' under the 'Settings' menu. If your desktop doesn't have one, you can download it from Software Center. Not the answer you're looking for? Browse other questions tagged shortcut-keys 18.04 brightness or ask your own question. Where are the brightness controls? How to switch between options in `/sys/class/backlight` to solve brightness problem? How do I get the brightness buttons on a Dell Inspiron N4010 working?